The average person will spend up to a third of their entire lives in bed, and as a result the bed can become a collection point for some very unpleasant things. When a mattress has gone a long time without being cleaned, it can gather dead skin known as dander, dust mites that feed on it, fleas, ticks, and bedbugs. If you have never had your mattress professionally cleaned, you should call us today! Letting these irritants stay in your bedding increases the chance that at some point you will become a victim of your own bed. Do you ever experience headaches, fatigue, coughing, or asthma? All of these are telltale signs of an unhealthy bed, but we have the affordable solution. We are now offering the bestmattress cleaning in Londonand we would appreciate the chance to earn your business. Our professional mattress cleaners in London have years of experience treating the most stubborn bedding conditions and we are certain that we can remedy all of yours. From stains by food and drink, to vomit, or oils from your body, our mattress steam cleaning process can leave your bed fresh and smelling well again. Our deep cleaning process removes stains as well as pests up to the highest possible standard. If you have never had your home’s mattresses fully serviced by competent professionals, you must call us today! We can be reached anytime by calling on 020 3404 5124, and one of our trained representatives will be happy to assist you in any way possible. You may also use our online booking form to request free quotes or service. Please take a moment to view our testimonial page, so you can get a feel for the level of service we provide and what our clients think about our low prices. Protect the health of your family, contract with our professional mattress cleaning company today! Why Our Mattress Cleaning Service is Helpful for You? 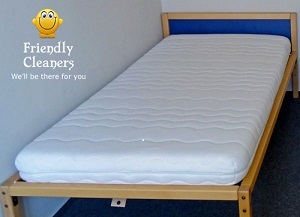 Friendly Cleaners deliver the safest and most reliable mattress cleaning at a price that you can afford. Our cleaning experts will deep clean and sanitize your mattress, protecting your family and especially your children from possible allergies and respiratory problems. We have all necessary equipment to kill and remove all the allergens, bacteria and mould spores that may trigger reactions. To protect your health we use the most advanced machinery and eco-friendly solutions to penetrate deep into your mattress and remove all dirt and dust mites. We provide powerful steam cleaning and deep-down suction to eliminate ground-in soil and refresh your mattress. Our powerful products are safe and gentle to the fibres. We use the newest and modern technique that vibrates the mattress and allows powerful vacuum extraction to remove all dead skin, mites and debris that we react to. We can ensure that your mattress will be in the essential healthful and hygienic state. A professional mattress cleaning is highly recommended if you have small children and pets and we recommend you a thorough cleaning at least three times a year for your healthful environment. Book Our Mattress Cleaning Now! If your mattress needs a professional thorough cleaning now, you can give us a call immediately and our cleaners will come at the right place and at the right time to help you. No matter if early morning, afternoon or late evening, you can contact us at any time convenient to you. We are available even at the weekends. Our friendly advisors are ready to give you information about all of our services. Call us now and make a booking! Take relax and enjoy the amazing performance of our friendly cleaners! Mattress cleaning – “The Friendly Cleaners team did wonders with my old and worn mattress. The whole mattress was cleaned, refreshed and deodorized. I am pleased of how fast and competent was. Great work!"